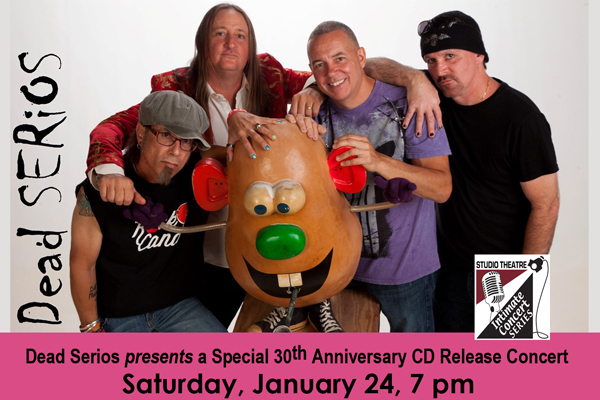 Dead Serios presents a special 30th Anniversary/Tribute CD release concert event! Described stylistically as Frank Zappa-meets-Metallica at the Willy Wonka factory, the award-winning band Dead Serios first launched from Florida’s Space Coast in 1985. They continue to delight fans with its unique brand of irreverent, high-energy rock and roll. Celebrate 30 years of foolishness with the band’s biggest production ever in the intimate setting of the Studio Theatre at the King Center for the Performing Arts. All the hits. All the hype. Special guests. Spectacular surprises and more! Deluxe VIP Packages available.